Have you entered my Thank You Giveaway (here) yet? If not, please go do so now! I'm giving you the option to pick what you win. I'm going to spare you the drama I'm having right now with my blog (I'll save for a later post) and move on to, what seems to be a new weekly post, "I would give anything to own these items" for this week! This week I decided to focus on rings since I love wearing rings. I have a tray that a former boss brought back from Jerusalem for me that sits on my dresser filled with rings. Dainty rings, chunky rings, animal rings, to just weird rings-I seem to have a variety. Every morning as I get dressed I spend most of my time trying to decide which ones to wear, even though I usually always settle on the same ones. So here are a few of my favorite ones right now that I would love to add to my collection. I can not mention the word "ring" with out automatically lusting over nOir's selection. I am so infatuated with their jewelry that it's not right, I just wish they weren't so pricey. I need to start saving so I can invest in one of their pieces. Their jewelry is very cutting edge but chic at the same time. Their rings aren't your usual ring, and guaranteed when you wear one of these you'll get looks and compliments. 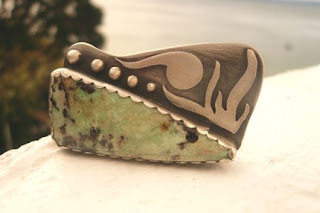 This gorgeous ring is by Swoon Jewelry (Etsy site) that I found on Etsy. 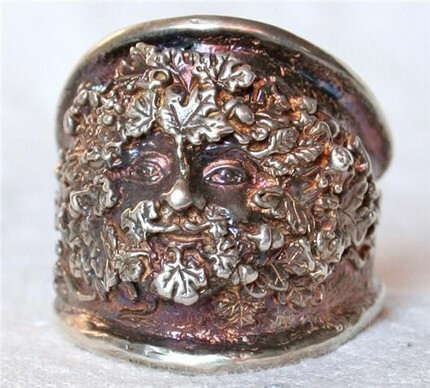 Etsy really has some great pieces by people all over the world. I love the colors and the back of this down by the sea ring (here). Rachel Rachel Roy always has some fun rings to offer and they are usually very reasonably priced. Right now till May 24th she is having a Friends and Family sale- 30% off everything! So if you want to pick one of these rings up, definitely do so now (here). When I saw this silver Greenman ring by Post Gate Jewelers on Etsy my mouth fell open. The work and detail that went into this ring is gorgeous and definitely worth the price. How about a few fun rings? I love the waffle ring by etsy site-Fatally Feminine, but I'm afraid that if I wore it I'd want to eat my finger every time I got hungry. The ring by JuJulee's site gives a whole new meaning to diamond ring. This bee ring by etsy site Three Birds looks so real and its surprisingly really cheap for a brass ring. Ever see something and when you see it you can instantly picture someone wearing it? Well when I saw these rings I could instantly see Karen from WhereDidUGetThat.com wearing them. They have this earthy feeling to them which I think drawls me to them. I love the Eye of Osiris ring. The last rings I bring to you are by Alkemie. I just stumbled upon this jewelry this afternoon on shopbop.com and fell in love. They have this awesome spider necklace, but the animal rings really caught my eye. I love the Giraffe ring (not pictured) and the fox ring. I think if someone said to me, "Okay, you can have one ring from all of these you posted about. Which one will it be?" I wouldn't know what to answer. I love all of these rings and would love to add any of them to my collection. So,my shopping companion, I'm going to ask you- Which ring out of all of these would you choose? 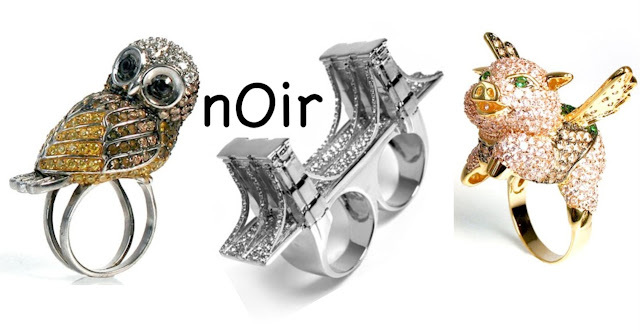 I would choose the owl ring for a fancy event, and the waffle ring for casual. I don't even like waffles, but it's so darn cute. I prefer pancakes without syrup. oh wow!!! i love that bridge ring! I've always loved rachael roy's accessories, but not i get to branch out! thanks for introducing me to nOir! I DIE for Noir too! They have Noir on the online sales a lot. I scored an awesome bracelet on Gilt a few weeks ago for only $42. Keep your eyes peeled. wow those rings all are beautiful! I love them.. Rachel roy makes such cool things.. like your blog. stop by our fashion blog,we are giving away designer glasses.. we hope you love it!